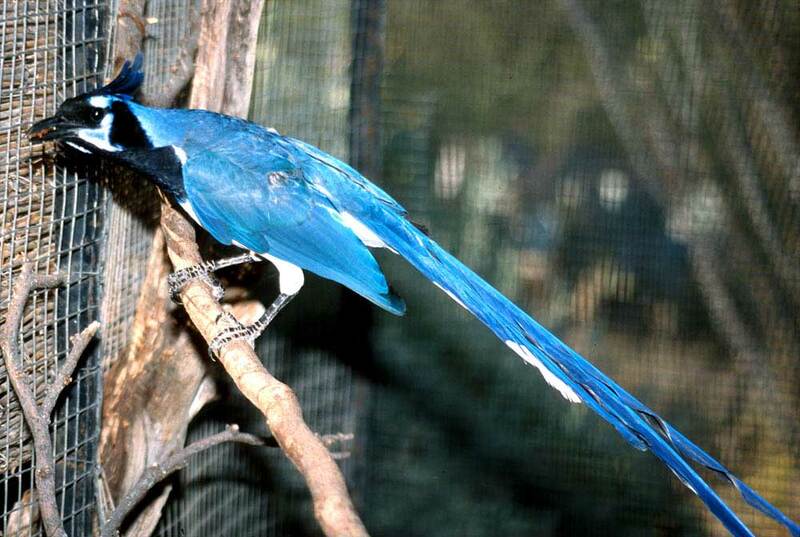 The black-throated magpie jay (Calocitta colliei) with its long tail and raucous cry is a conspicuous bird in tropical deciduous forest in southern Sonora. The Spanish common name urraca is onomatopoetic. Photo: K. Krebbs. 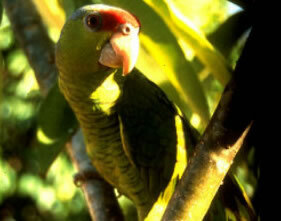 There are two species of Amazon parrots in southern Sonora. The white-fronted parrot (Amazona albifrons) is a small species than is locally very common in coastal thornscrub and open tropical deciduous forest. 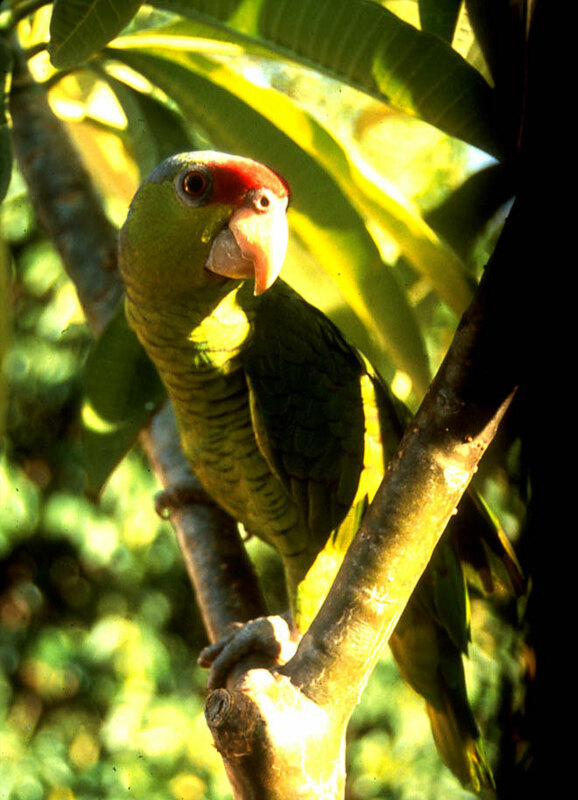 The larger lilac-crowned parrot (Amazona finschi) pictured here is less common but more commonly seen in tropical deciduous forest. Photo: S. A. Meyer. The anoles are a diverse group of tropical lizards that have been considered a subfamily in the Iguanidae or in the family Polychridae). The false chameleon (Anolis carolinensis) of the southeastern United States is well known for its rapid color changes from green to brown. The clouded anole (A. nebulosus, above) with its orange dewlap lives in the tropical deciduous forests of western Mexico as far north as the Tepoca area in east-central Sonora. Photo: G. M. Ferguson. 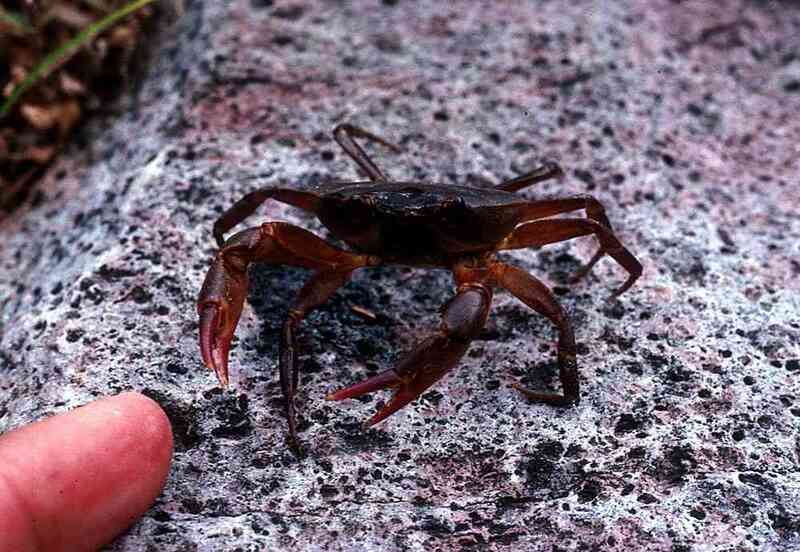 The Sonoran land crab (Pseudothelphusa sonorensis) lives in moist rocky canyon bottoms in tropical deciduous forest. It is the northwestern member of a group of tropical terrestrial crabs. Photo: G.M. Ferguson from east of Alamos, Sonora. 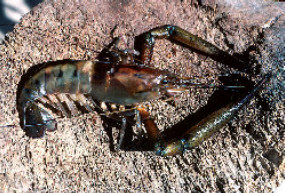 Three species of freshwater prawns (Macrobrachius spp.) live in rocky freshwater streams and rivers on the Pacific slopes of the Sierra Madre Occidental in Sinaloa and southern Sonora. 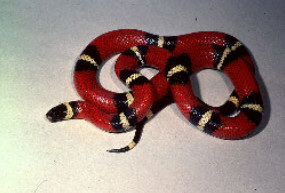 The one shown here (M. americanus) was photographed in Sinaloa. In Sinaloa and southern Sonora they are called cauque and are harvested in sufficient numbers to be served in rural restaurants. 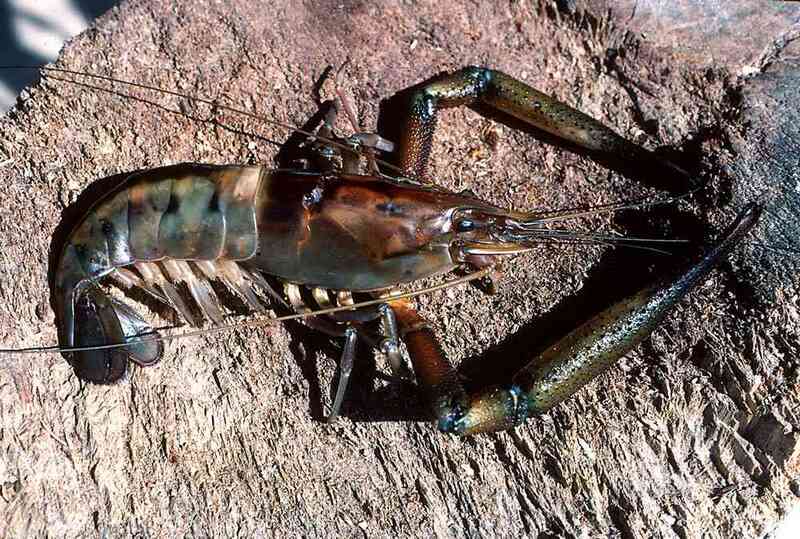 In the 1970s freshwater prawns from the Río Cuchujaqui near Alamos were exhibited at the Desert Museum, but not been seen in the Cuchujaqui in recent decades. They may have been extirpated by introduced tilapia (one of several genera) and largemouth bass/lobina (Micropterus salmoides). Its status in Sonora needs to be assessed. 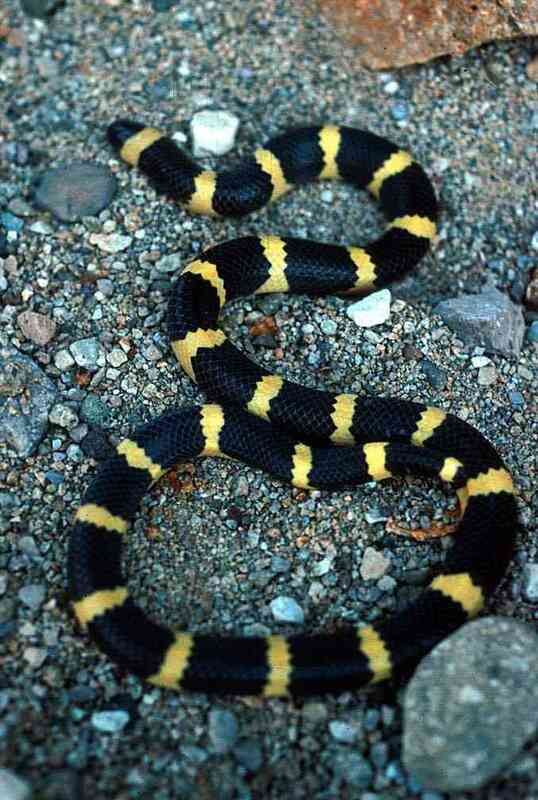 The filetail ground snake (Sonora aemula) is a small, stout tropical snake in tropical deciduous forest in southern Sonora and the deep barrancas in adjacent Chihuahua. 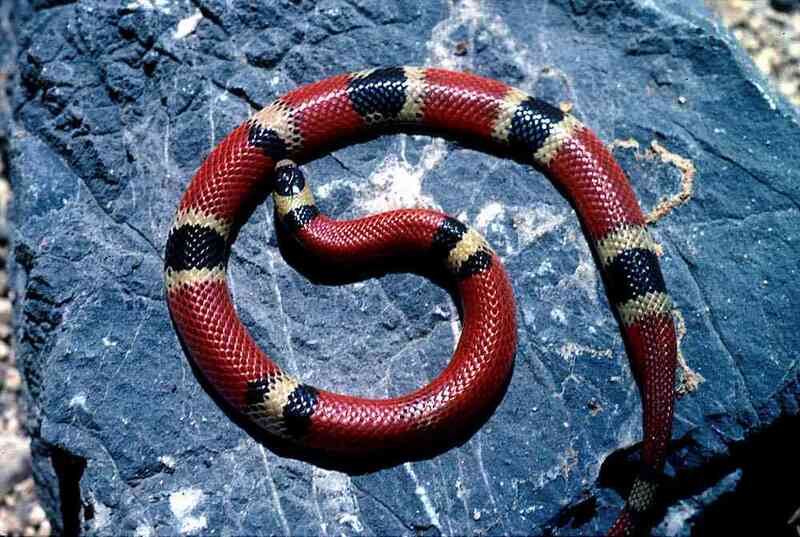 The ground color is red although the number of triads (a sequence of red, yellow, and black bands) on the body ranges from none to many. 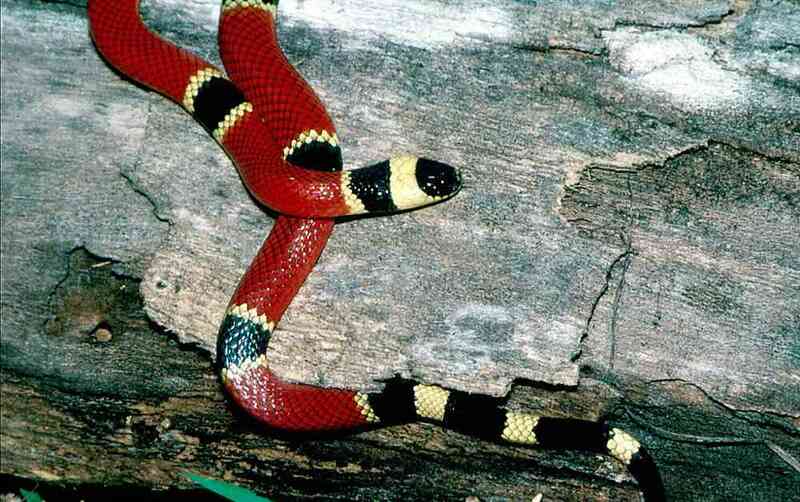 The order of colors in the triads can switch from red-black-yellow (non-venomous milksnake) to red-yellow-black (venomous coral snake) on the same individual! Strongly-keeled scales on its short, thick tail form a rough conical structure not found in other small snakes. One possible function is to plug up its burrow to keep out predators. It eats small insects including crickets. The indigo snake (Drymarchon corais) is one of the largest snakes in North America. It is found from Florida and south Texas south to South America. On the west coast of Mexico it is found in thornscrub and tropical deciduous forest as far north as the Río Aros in eastern Sonora (Aaron Flesch, pers. com., 2006), where it is known as babtuco, culebra prieta, or culbra azul. This heavy-bodied, iridescent blue-black predator eats a variety animals including toads, snakes, mammals, and birds. 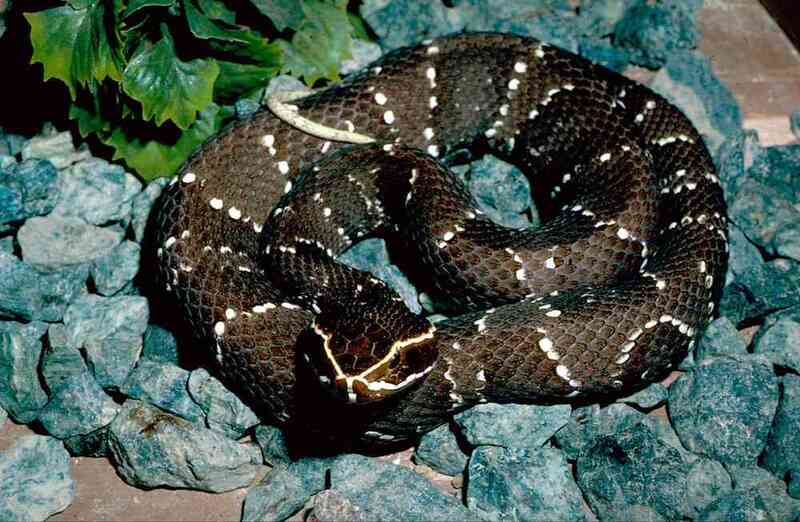 Snake-catchers need to be wary of its powerful bite and especially its foul-smelling musk, which is very difficult to wash away. 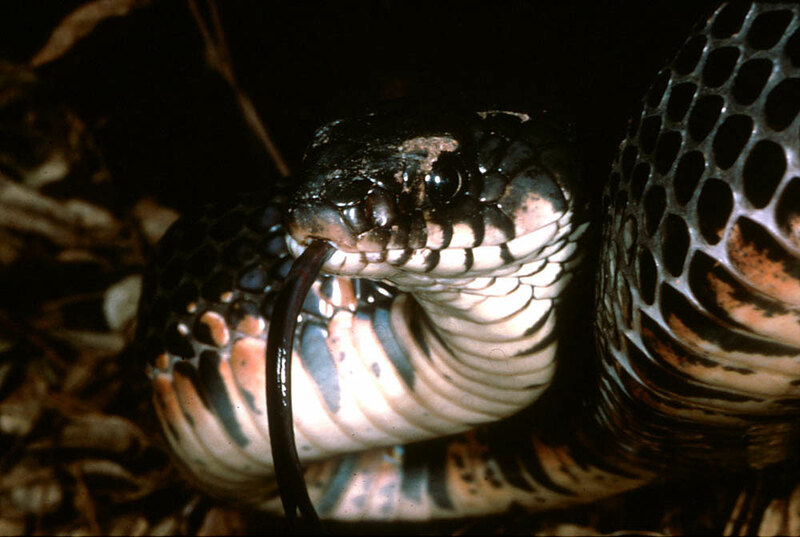 Indigo snakes are often found near water in rocky canyons and are strong swimmers both above and below the surface of the water. Photo: C. D. Bertelsen. The Mexican short-tailed snake (Sympholis lippiens) is a secretive small snake that is occasionally found in tropical deciduous forest near Alamos in southern Sonora. One might assume that the species name lippiens refers to its oily skin, but spelled with the double "p" it means "dim-sighted". This very odd snake feeds on beetle larvae that are commensal in the mounds of Atta mexicana (Mexican leaf-cutter ant, mochomo). The oily skin may protect them from being attacked by the mochomos. Click here for a more detailed account. Photo: S. A. Meyer. 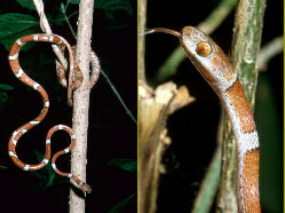 The bluntheaded tree snakes (Imantodes spp.) are extremely slender vine snakes that specialize in eating small arboreal frogs and lizards. Lacking the musculature for constricting, they depend on poison from rear fangs to immobilize their prey. 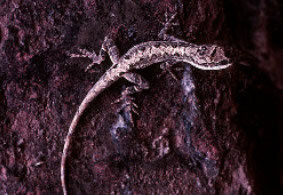 The species in northwestern Mexico (I. gemmistratus) and the clouded anole (Anolis nebulosus), its preferred prey, are found as far north as the Tepoca area in eastern Sonora. Photos: C. R. Schwalbe from near Alamos, Sonora. The genus Agkistrodon evolved in Eurasia and immigrated to North America from Eurasia probably 20 to 25 million years ago in the early Miocene. 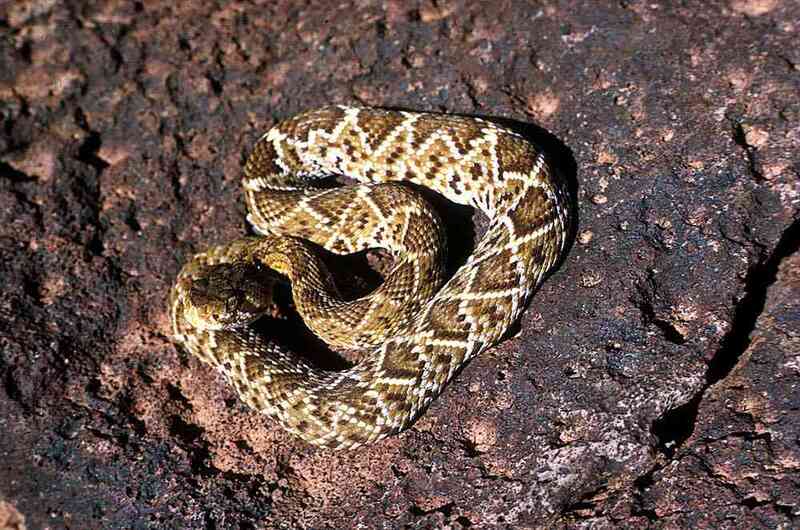 In North America, it radiated modestly, butgave rise to the very successful rattlesnakes (Crotalus and Sistrurus). The Mexican moccasin or pichecuate/cantil (Agkistrodon bilineatus) is a primitive Mexican relative of the terrestrial copperhead (A. contortrix) and the aquatic water mocassin (A. piscivorus) of the eastern United States and northeastern Mexico. It is found in tropical deciduous forests along the Pacific Coast of Mexico from Costa Rica to southern Sonora. The name Mexican mocassin is misleading because the pichecuate is terrestrial. Animals seen near Alamos are a rich red-brown to black color. Fearful ranchers say that the pichecuate can jump great distances and inject venom with the pointed tip of its tail; few have actually seen one. Photo: R. W. Van Devender. 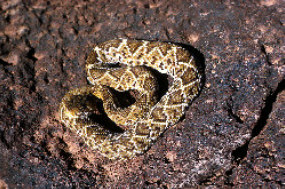 The Mexican west coast rattlesnake (Crotalus basiliscus) is the northwestern member of a group of rattlesnakes related to the Central American rattlesnake (C. durissus). It is found in tropical lowlands along the Pacific coast of Mexico from Oaxaca to southern Sonora. In some areas, it is a large, heavy-bodied, greenish snake that is very aggressive. In Sonora, it reaches only moderate size and lives in tropical deciduous fores. Clear white diamonds stand out againt a rich reddish brown background on the body. 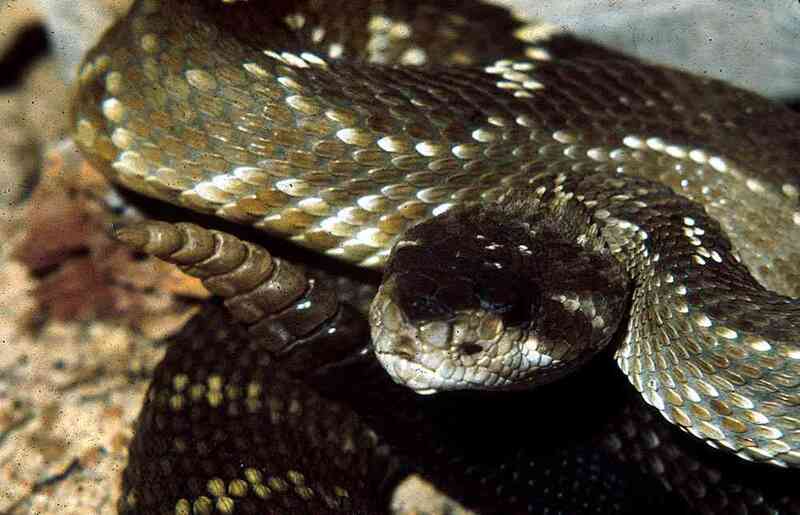 It has been controversial whether it hybridizes with the black-tailed rattlesnake (C. molossus), the víbora de cascabel in the woodlands and forests of the Sierra Madre Occidental and the desert ranges in northern Sonora. 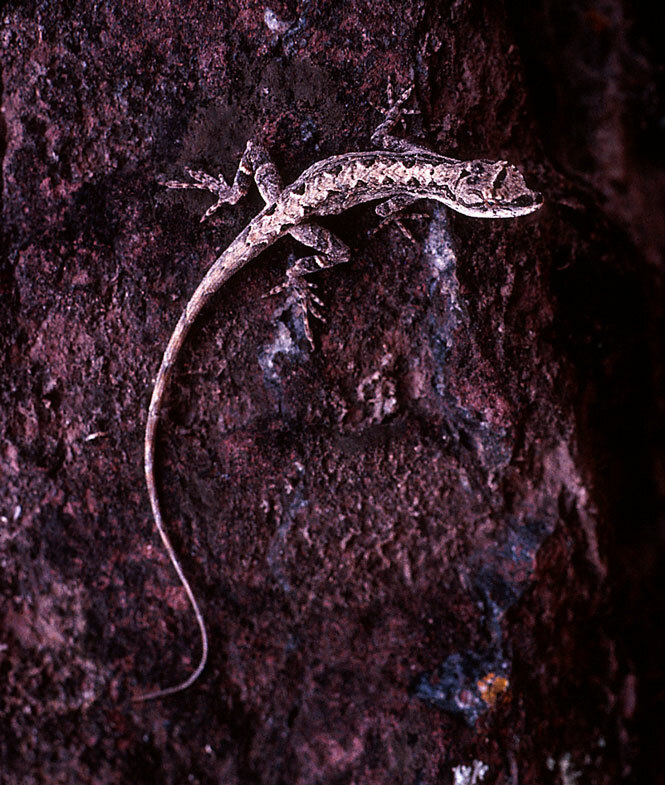 Specimen pictured here is a juvenile from near Alamos, Sonora. 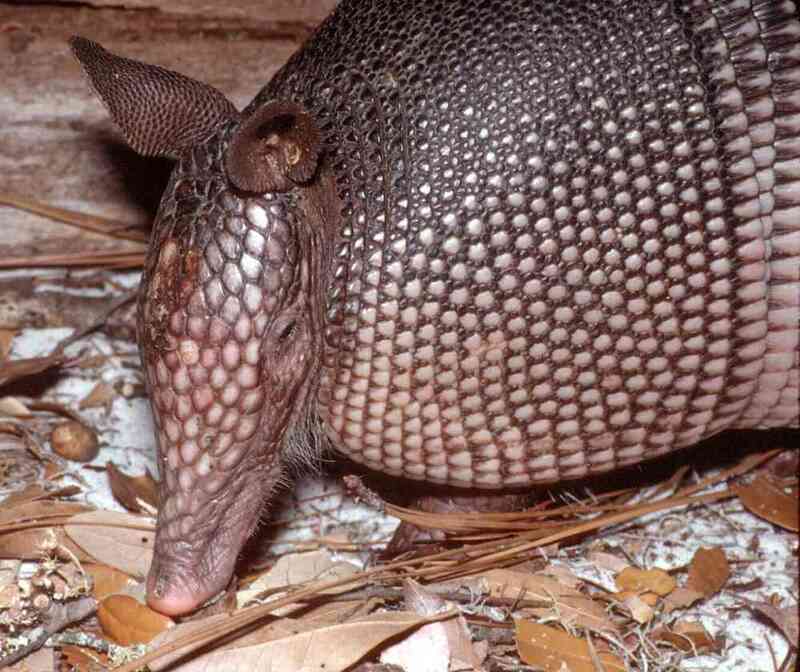 The nine-banded armadillo (Dasypus novemcinctus) is found from Argentina in South America north to Missouri and Florida in the southeastern United States, and northwest on the Pacific coast of Mexico to southern Sonora. For many years, armadillos were not seen around Alamos even though herpetologists intensively drove the roads at night in search of snakes. (Where armadillos occur, road kills are common.) 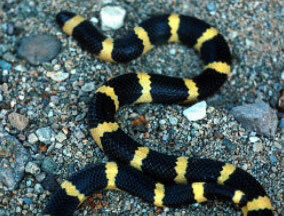 It is occasionally found in TDF around the Sierra de Alamos. Interviews with ranchers suggest that it has expanded its range as far north the Santa Ana de Yécora area in TDF, and possibly into the Maycoba area in oak woodland in recent years. 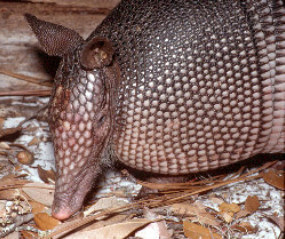 Mountain Pimas at Los Pilares told a priest that they had killed el diablo (the devil) when they encountered their first armadillo in about 1998. Photo by R. W. by Van Devender.